So fracking reduces carbon emissions, right? Fracking, the process of horizontal drilling into shale layers with slickwater injection, hydraulic fracturing, and subsequent gas (and oil) extraction, has dramatically increased US natural gas production in the last 10+ years. As much of the newly produced natural gas is burned in new power plants for electricity production, it has replaced a significant amount of electricity produced in coal-fired power plants. But that is not the dominant reason why US carbon emissions have been dropping. The main reasons US CO2 emissions have been dropping since 2007 is a combination of the recession (demand decline), improvements of energy efficiency/intensity, and the lowering of "carbon intensity" (expressed more simply as the amount of CO2 emitted per kWh electricity produced). However, there is a persistent myth that US carbon dioxide emissions are dropping mainly because of dropping carbon intensity, promulgated e.g. by popular press articles such as this one. A widely acknowledged research paper by Feng et al. (2015) from the University of Maryland, UC Irvine, and IIASA, published in Nature Communications in July 2015, lays out the details of how US CO2 emissions dropped. 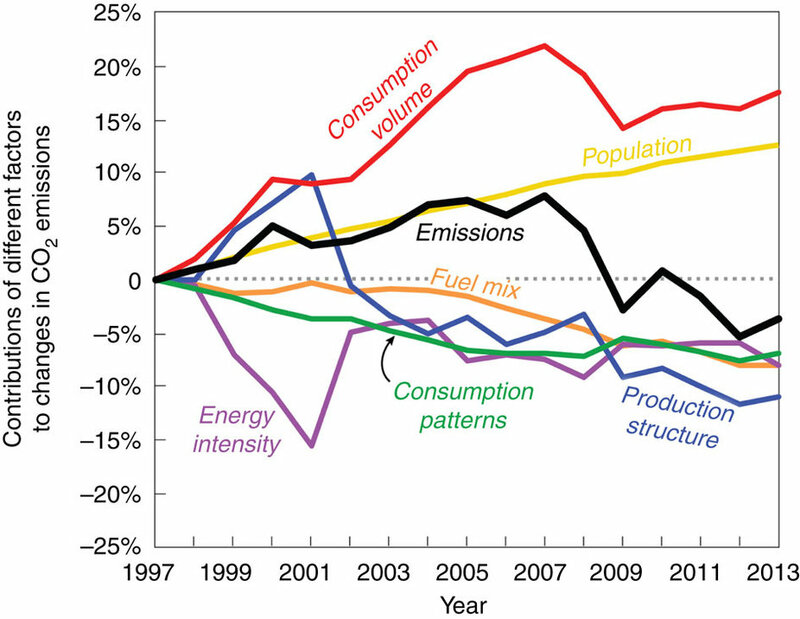 We are displaying Figure 1 below, which summarizes the results by showing the different sectors contributing to dropping CO2 emissions (arbitrarily anchored at the start year). The drop in the black curve after 2007 is in large parts due to a lack of "consumption volume" (red curve: demand decline) and a subsequent drop in "production structure" (blue curve: efficiency increase). The third contributor is the "fuel mix" (orange curve: carbon intensity). This has been understood for a while now, and was reaffirmed through a comment-and-reply discussion in the journal. Similar works by the Yale Climate Forum and a recent report by the White House Council of Economic Advisors (CEA). There was even a good summary in the Economist. Approximately one third of the US carbon dioxide emissions drop since 2007 is due to changes in electricity production away from coal combustion toward natural gas and renewable energy use. In the alternate reality of the fossil fuel industry and its front groups, however, this third could be thought of as the whole story if one reads only the headlines. And the right-wing press is quick to highlight fracking as the dominant source of declining emissions. While denialists such as Bjørn Lomborg predictably misinform, curiously, only the headlines but not the numbers in the right-wing press are lying ... once the carbon-intensity third is multiplied by the fraction of energy-production related drops that directly results from natural gas replacing coal, approximately two thirds, the contribution to total reductions from natural gas is around 20%. Not surprisingly, left-wing think tank ThinkProgress shot back through reprinting a detailed CO2ScoreCard article, which laid out a series of calculations based on the available data, and, though slightly outdated now, got it right in 2012. In conclusion, one has to read articles on dropping carbon dioxide emissions in the US carefully to distinguish between "energy-related" CO2 emissions, and "US CO2 emissions". The US Energy Information Administration (EIA) deals only with the former. We have discussed US methane emissions in a recent article, and there is no doubt that oil and gas exploration related methane emissions present a significant offsetting factor to US carbon dioxide emission reductions. Though the US fracking boom is likely not responsible for the parallel increase in global atmospheric methane, it is likely higher than inventoried, affecting global ethane and higher hydrocarbons, including air toxics. In turn, burning natural gas is much cleaner than burning coal, reducing other air pollutants such as PM, SO2, and NOx. Much of the discussion about natural gas and its greenhouse effects thus relates to local vs. global and short-term vs. long-term impacts, with some of the science still developing. A big concern is committing to more natural gas infrastructure, and then figuring out 15 or 20 years down the road that we've got a lot more than we want or need and are on the hook to pay for it. [...] Another concern is, investments focused on natural gas will crowd out clean energy. The role of natural gas as an element of a carbon dioxide reduction strategy should thus be determined carefully, not based on short-term fossil fuel interests only. What is a little disquieting about all of this is that the world output of Carbon dioxide has apparently been decreasing over roughly the same period. Yet despite this, if you look at the Mana Loa site for Carbon dioxide increases from Jan2015 to Jan2016, Feb2015 to Feb 2016 etc, the jump is far greater than for similar intervals in the past years. What is happening here. Is it simply an effect of the severe El Nino we have just gone through or is something more sinister happening. Have one or more Carbon dioxide sinks started to shut down. We will have a better indication as the 2016-2017 figures start to come out next year as the effect of the El Nino fades away. If this is indeed a persistant trend, and continues at the same rate as it is doing now, it halves the time we have to reach whatever maximum allowable Carbon dioxide ceiling you subscribe to. It is really not just a matter of whether or not it replaces coal. NG can replace coal in 2 major ways: 1) as the fuel to a boiler that could otherwise use coal or 2) being burned in a gas turbine hooked to a generator with the hot exhaust then used to boil water into steam fed to a steam turbine/generator. The latter is called a combined-cycle setup and it is a very different animal. In particular, it can be turned off and on rapidly (Minutes?) and after warmup, it can provide a combined thermal efficiency close to 60% versus about 40% for a steam only plant. This makes combined cycle a very useful method of filling gaps in renewables caused by changes in the weather. So, the discussion of utility of NG isn't just about methane leaks and the fact that burning it produces relatively more heat for a given amount of CO2. william, I think this article may be helpful. gws - "power NG plants are rarely planned as combined cycle,"
I would stunned if there were gas power stations being built that werent CC. It doesnt make economic sense. Can you provide examples please? ah, sorry. meant cogeneration. IIRC, cogen is the most efficient use of the fuel's primary energy content, especially when relatively small plants are used to provide district heating (neighborhood scale). I’ve worked on gas ICE engines (up to 2 MW) and in co-en applications they can reach 90% efficiency. The major issue with using gas remains that it is a fossil fuel – but it doesn’t have to be. For example Chris Goodall in talking about a sustainable energy strategy for the UK (if Hinkley C dies, which it still may) states that “The real opportunity is finding ways of storing large amounts of energy for months at a time. This is where the need is greatest, and the possible return most obvious. More precisely, what we require are technologies that take the increasing amounts of surplus power from sun or wind and turn this energy into storable fuels. In The Switch, a book just out from Profile Books, I explore the best ways of converting cheap electricity from renewables into natural gas and into liquid fuels similar to petrol or diesel so provide huge buffers of energy storage. There are several methods by with this could be done aside from the above mentioned bio-chemical pathways i.e. via the Sabatier reaction (https://en.wikipedia.org/wiki/Sabatier_reaction) and several pilot plants are already in operation. Thus replacement of coal plants by gas could be an advantage if and when sufficient renewable exist to provide excess power for production of manufactured fuels. Goodall has noted that this is already sometimes the case in the UK, National Grid was been willing to pay up to £60 per MW to take excess off their hands this summer. Likewise Audi has a 6MW methane producing sink tied to the German grid.